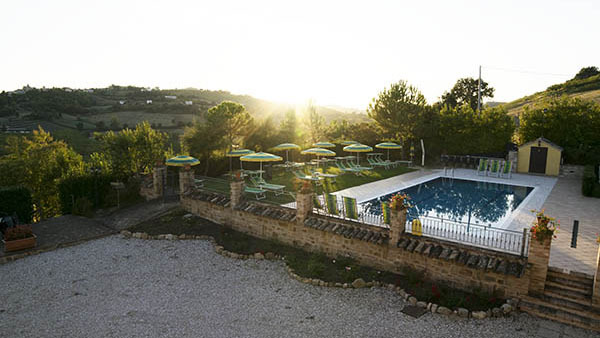 Spend a holiday onto the gentle hills of Marche region! Relax and Wellness will accompany you for your whole stay. The Wellness Centre and the staff of Colle Indaco will turn your holiday into an unforgettable holiday! An oasis of rest and relaxation surrounded by the nature of our hills and valley where you can rejuvenate body and mind with spa packages that will awaken your senses. Come and experience the feeling of inner harmony and relax that you try at Colle Indaco. The accommodations are elegantly furnished with 19th century furniture, original and restored by craftsmen. Our pool is 12m x 6m and is designed with overflow system that guarantees the best water cleaning and allows the use of few substances. Thanks to this our guests can swim in a very healthy water. Experts in the art of massage and skilled beauty therapists will pamper you to restore your feeling of harmony and to make amazing your every day. Two cozy restaurant rooms, called as two of Marche region's best wine 'Falerio' and 'Rosso Piceno', where you can taste typical local dishes (from the Fermo and Ascoli Piceno areas) but revised for refined tastes. Colle Indaco is also a wine producer. to give a tasty feeling of balance and harmony. The Certificate of Excellence honors accommodations, restaurants and attractions that consistently receive great traveller reviews on TripAdvisor. The Ospitalità Italiana quality brand is a certification promoted by the Chambers of Commerce to evaluate the quality of the accommodation and catering services in Italy.